The creation of instant gtbank account through facebook is a very nice development and has made different impact in the society today. With this new development you can be at home and perform 80% of your new GTBanks account opening process so why don't you get started today. choose the type of account you want to create, fill in your Email Address and then your Location and then Click on Continue. Choose your favorite of all of the account types listed below. 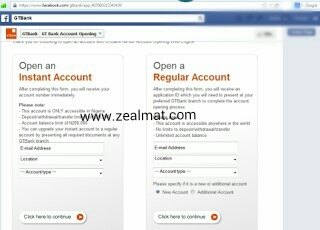 When your are through filling the form, you would be display of a confirmation page with your Transaction code on it. Does this mean I don't have to go through all the stress in the banking hall? If yes then I'll get one for myself.